In its artist residencies program, VIDEOFORMES welcomes for three months the duo Imaginary Systems to carry out an exceptional production of digital art which will be presented in world premiere at Gilbert-Gaillard room of Clermont-Ferrand during the VIDEOFORMES 2019 festival, from March 14th to 30th. The project consists of five miniature landscapes, of different sizes and shapes, augmented by generative sound and light devices. 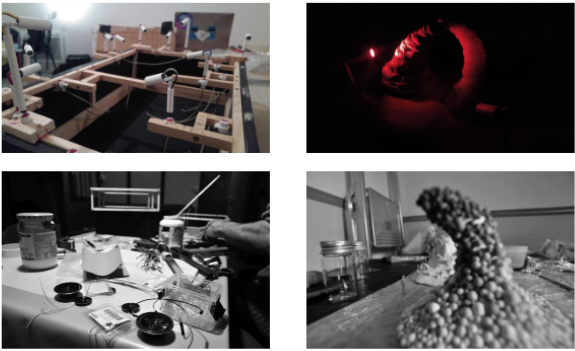 Between sculpture, architecture model, animated cinema and generative creation with new technologies, Dissimilarium 0.1 is proposed as a transmedia work. For the artists, this work is the opportunity to develop a global writing in which the fluidity between the media transcends the separations between domains of expression. Dissimilarium 0.1 is a creation of Imaginary Systems. Alps), FabLab Le Pensio (University Clermont Auvergne / Le Puy) and Comme1image.